Yesterday, I wrote about making a BIG impression with a custom-shaped USB Flash Drive. 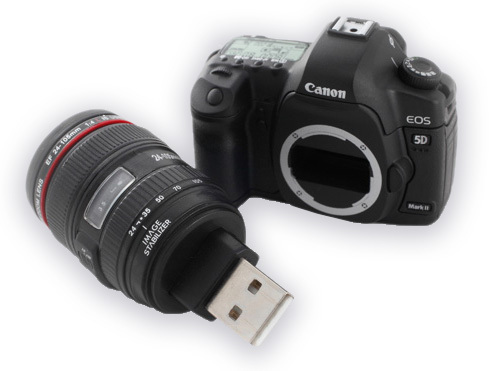 Today, this custom USB in the shape of a Canon 5D Mark II with EF 24-105mm f/4L IS USM lens is making a big splash on ebay. It was given to the members of the Hong Kong Canon Club. This club also received custom USBs in the shape of a Canon 450D. The detail is amazing. Anyone receiving it would definitely be WOWed. This was a big ticket promotion which will be remembered for years. Great way to promote the launch of a new product. Give a unique promotional item to a vocal and prominent group and let them talk about it to create buzz…or in this case, sell them on ebay and get the rest of the fan-base talking. ← Previous Previous post: Step-up Ring will save you from buying another set of filters.